Watches "curved to fit the wrist" were in style in the late 1930's, Sometimes the cases curved dramatically while other models had flexible lugs so the watch could be worn on the side of the wrist.s The latter are often called driver's watches. Movements started to get smaller too and by the 1940's there were many men's models that were tiny, especially when compared to today's standards. Ladies watches got smaller too - so small that it's often hard to tell the time, but all the diamonds that adorned them made up for that. 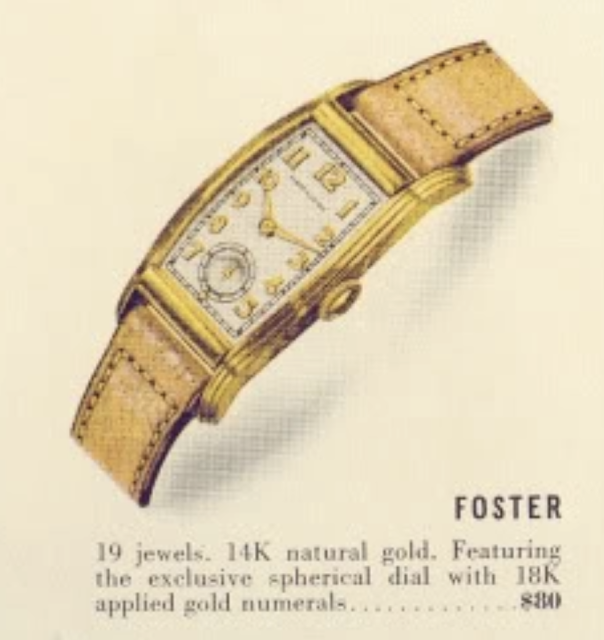 One of the innovative models that Hamilton introduced in 1939 was the Foster. It was only produced for two years and although it's not unheard of, it is not an easy model to find. It's cased in 14K gold and was priced at $80... that was the equivalent of $1,450 in today's dollars, when adjusted for inflation. It was not an inexpensive watch. If the Foster looks familiar, it might be because it looks a lot like the Linwood. 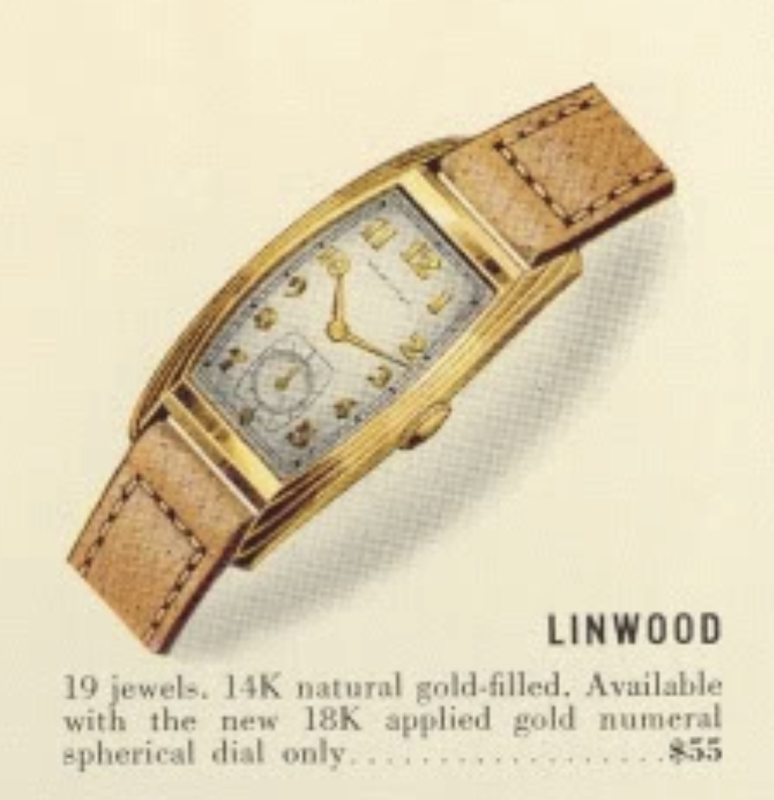 The Linwood was introduced the year prior, 1938, and came in a 14K gold filled case. It's a much more common model and easier to find. The case has a very similar design with ridges along the sides. Both models feature "spherical" dials where the dial is curved from top to bottom as well as from side to side. The easiest way to tell a Foster case from a Linwood is the lugs on the Foster flare outward a little while the Linwood sides are a consistent curve. The Linwood is an interesting model in that it had either a 17 jewel movement or a 19 jewel movement, depending on the year. The Foster is also interesting in that it has either a 19 jewel 982 movement or a 19 jewel 982M movement, depending on the year. Originally the 17 jewel 980 movement was used in gold filled models and the 19 jewel 982 was used in solid gold models. In 1940 the 19 jewel 982M medallion movement was introduced for solid gold (and platinum) models. Then the 982 was used in 14K gold filled cases and the 980 went into 10K gold filled (or stainless) cases. That's an interesting bit of trivia. My Foster project watch is already in pretty good shape but could still use a little TLC. The lug width is 9/16" or 14mm so getting a strap for it can be a challenge. This watch has a long bracelet that's not original but seems to look okay. I don't like the spring loaded ends of the bracelet though, they will eventually wear grooves into the inside of the lugs. The back of this watch is unremarkable and doesn't show too much wear..
One way to tell a Linwood dial from a Foster dial is the marker at the 6 position. The Linwood should have a star and the Foster has a gold dot. Of course, that assumes the marker isn't missing or hasn't been replaced. The Linwood also has a barrel-shaped outline surrounding the seconds register while the Foster has just a circle. I can tell this dial has been refinished in the past. It looks fine but the notch on the side by the crown is an obvious tell that it was previously redone. The movement is a 982 and the serial number dates to 1938. That indicates this is an early Foster. Hamilton watches were introduced in the Fall of the previous year, sort of like cars, so you could buy a 1939 model in October of 1938, for example. Wow! There are a LOT of watchmaker's marks inside this case back. I didn't count them but there's hardly enough room to add another one. I find watches like this to be interesting... this watch has been well maintained but you never know what prior people have done to the movement along the way. The glass crystal has a couple of cracks in the corner and the inside of the lip on the crown side appears to be bent inward. I might be able to straighten that out later. One of the dial feet screws is missing. The mainspring inside the barrel is a white alloy design but the end of it looks a little unusual - like it's set up for a T end or a Swiss-style tang end. I suspect it's not a Hamilton spring but more of a generic spring. As long as it's the appropriate strength it should be fine and not need to be replaced. The reassembled movement is ticking away with good motion. Looking good... just a minor tweak to the regulator to speed the watch up a little will be needed. The amplitude of 250 and the low beat error are perfect. So the mainspring is good to go. The finished watch looks great. I need to replace the crystal though, I find the cracks in the corners to be a minor distraction. It will look as good as it runs once it has a new crystal. Dan. I think I have a 14 mm leather strap I got for a Linwood but never used. Would like me to mail it to you? Sure, if you're not going to use it! Thanks!